Spectacular Gulf views from your 11th floor condominium. Watch sunsets every night on your furnished screened-in balcony with no shortage of photo opportunities of breathtaking scenery and purple skies. 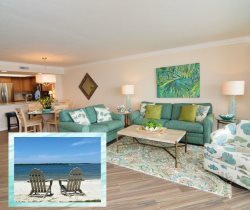 Our Sanibel Harbour, Florida vacation rentals are well-appointed with a delightful array of blues and green tones to make up an appealing Florida-style decor. Completely renovated 2018 equipped with new appliances and furniture. There is a TV in the living room and both bedrooms, and a DVD player. Enjoy a meal on your furnished balcony while watching for dolphins in the water below! King bed in the master and queen in the guest bedroom. Sleeper sofa in the living room. Sleeps 6 people. You may have found this rental on HomeAway 7594049, HA ID 7594049, VRBO 7594049ha, or Vacation Rentals 7594049. Their responses were always prompt. They sent deluxe and luxury options for consideration that we didn't find on line. We met them at the office and everyone was very friendly and knowledgeable. Great place to stay. Loved the view. The beach did not look too inviting. The pool could have been nicer -- the pool for the tower next door seemed larger and nicer. We enjoyed our stay. The view was breathtaking from the lovely lanai. The property was calm and peaceful, love the quiet hours. Some of 1134 features are dated, particularly the master bath. Condo functions very well and is quite roomy, loved the layout. Loved the opportunity to use the resort right next door, ran next door each morning for my morning Starbucks after using the lovely jogging/walking paths. Kitchen was well stocked with all the dishes and appliances you could need. Everyone we came in contact with was friendly and professional. We had a wonderful one week stay! Your proximity to Sanibel/Captiva as well as Ft. Myers/Bonita beaches made for easy access to shell collecting and water activities. The views of the bay and sunsets from our living room/porch were exceptional!! We would definitely stay here again on a return visit to soutwest Florida. The view is awesome, I could have stayed on the lanai all day, very relaxing. I also understand the room is standard.